Engagements, bridal showers, weddings, birthdays, anniversaries, a new home and the birth of a baby are among life's more significant milestones. 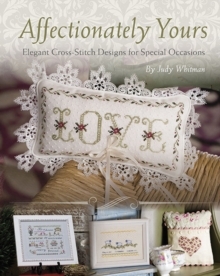 Join noted designer Judy Whitman as you stitch a collection of 11 elegant cross-stitch designs to honour and celebrate these occasions. Inspired by antique quilts, samplers, china and linens, each hand-stitched piece is intended to become a cherished keepsake to be treasured for years to come. Many of the designs are personalised with monograms or names and date, continuing a time-honoured tradition of honouring those we love with a gift stitched with a needle and thread.